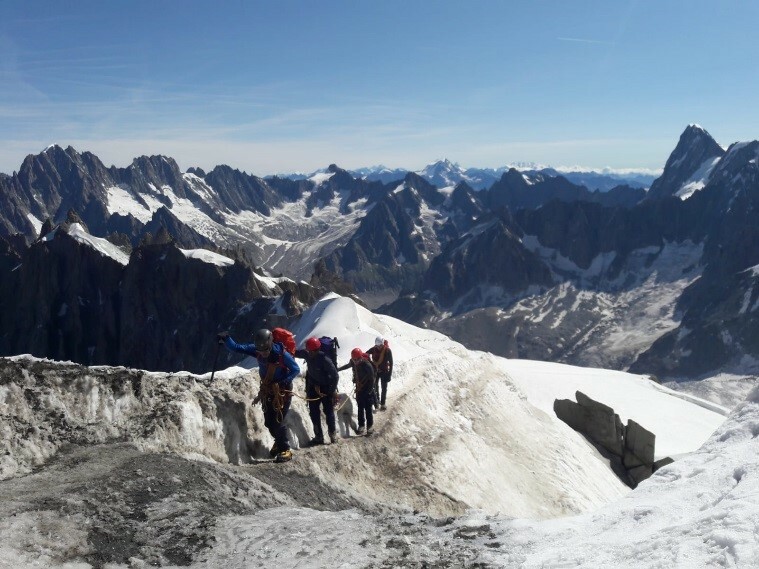 The Aim of Exercise Tiger Alpinae Experientia 18 was to conduct a Level 3 Arduous Trekking and Alpine Mountaineering event in the French, Italian and Swiss Alps. Adventurous Training is core activity (strategic/essential activity) and this exercise helped develop psychological resilience. This exercise enhanced the Battlefield Discipline Sub-Skills of the Back to Basics Soldier First Syllabus. 17 personnel attended this exercise from 30 July till the 12 August and included 13 Regular and 4 Reserve soldiers from Colonel to Private. Personnel worked in 4 teams through a 14-day package including travel. The ethos was to move fast and light with minimum kit and equipment but always ensuring the correct items were carried to guarantee a safe training environment. The trekking route passed through France, Switzerland and Italy. This version of this justifiably popular trek was adapted to fit into a 6/7-day exercise and is suitable for military trekkers looking for a serious challenge. At the heart of the European Alps, the massif of Mont Blanc includes some of the most spectacular mountain scenery imaginable. This classic point to point trail (with fast uphill hikes) was completed carrying a day pack. 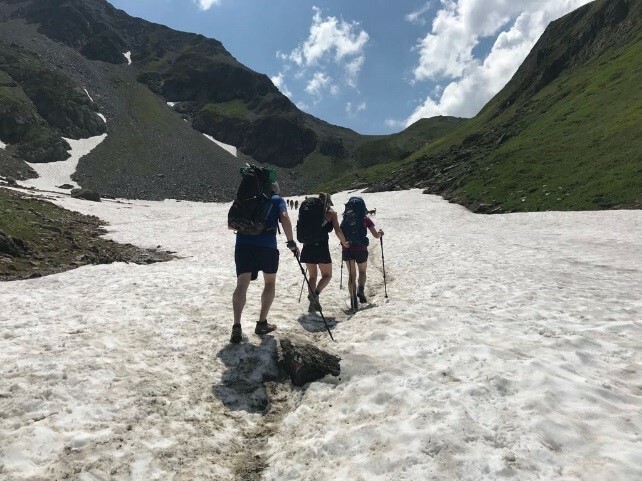 This route involved a lot of ascent and descent, a challenge that is suitable for fit personnel who are also used to a variety of mountain trails and conditions. Official campsites were used after each day trekking for accommodation under 2 person shelters. 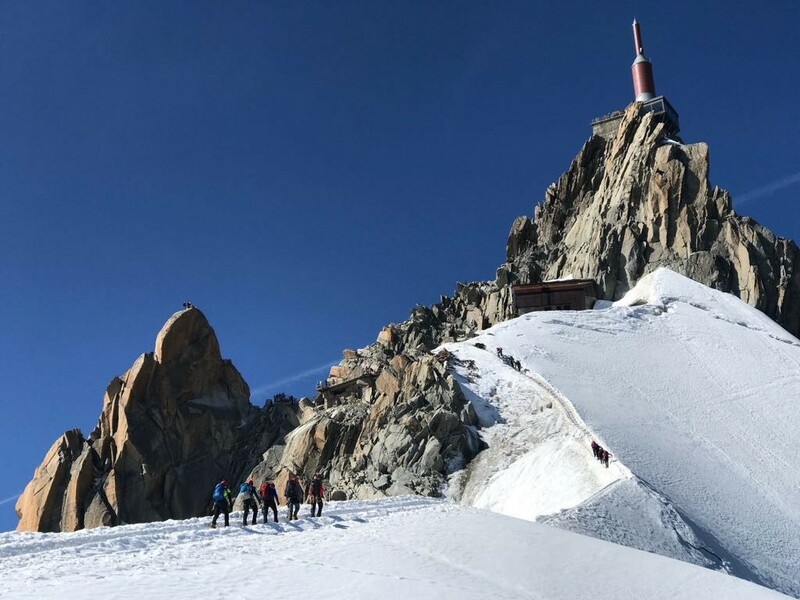 The mountaineering route had the typical Alpine early starts from 5 different huts, across glaciers and snow fields to climb 4 different peaks over 5 days. All routes were in the Facile + grade to ensure the ratio of 1 x AML to 4 students was adhered to. The previous trekking route was part of the acclimatisation period. The mountains were all less than 3,500m apart from Aig de Toule which is 3,559m. 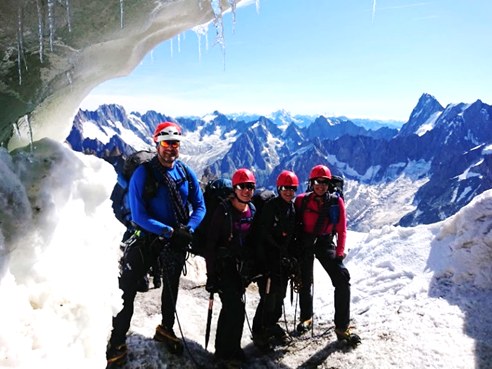 The mountain phase finished with a high-altitude trek across the Glacier Du Geant to the Aiguille Du Midi at 3,842m. The cable car was used to descend to Chamonix to finish. Significant parts of the exercise took place at medium to high altitude and consequently there was a risk of the effects of altitude. 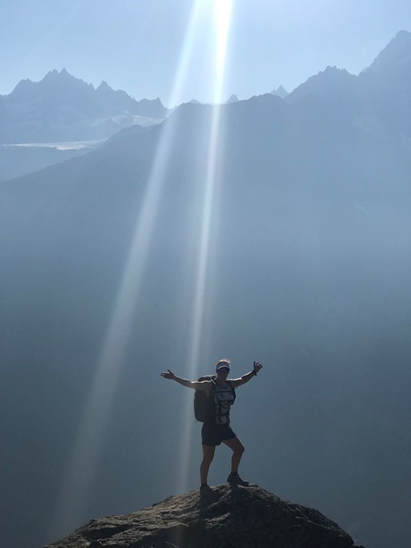 The acclimatisation programme (The Trek around the Tour Du Mont Blanc and subsequent 5-day mountaineering program) was built into the itinerary to help prevent the onset of altitude illness, a spectrum of illness associated with ascent to altitudes usually higher than 2,500m. In mountainous terrain, the weather can vary considerably. The average temperatures ranged from 15-30°c in the valleys and 5-15°c on the passes. The weather was good for the whole exercise. Sgt Tammy Ruvino (Reserve Soldier from 102Bn REME). “We all prayed for fine weather, good trails and everyone to be fit enough to endure what was about to be undertaken. For some people, what was ahead of them came very much as a shock as they had never had the pleasure of tackling such terrain, or witnessed such beauty as you do in the Alps. It was a great concept and challenge to find new places to erect our tarps each night, battling with the weather and constraints that came our way, but also very rewarding and something to look forward to at the end of each day. As the week went by our techniques quickly improved, our routine more refined and we all adapted well to our new daily life. The small teams quickly bonded, both out on the trails, and in camp routine, as did the wider section, which was to be an advantage for the coming week. The weather was kind, most of the time, the views as breath-taking as ever, as were some of the climbs. People were getting stronger and more confident, and felt ready for the week ahead after the acclimatisation phase. 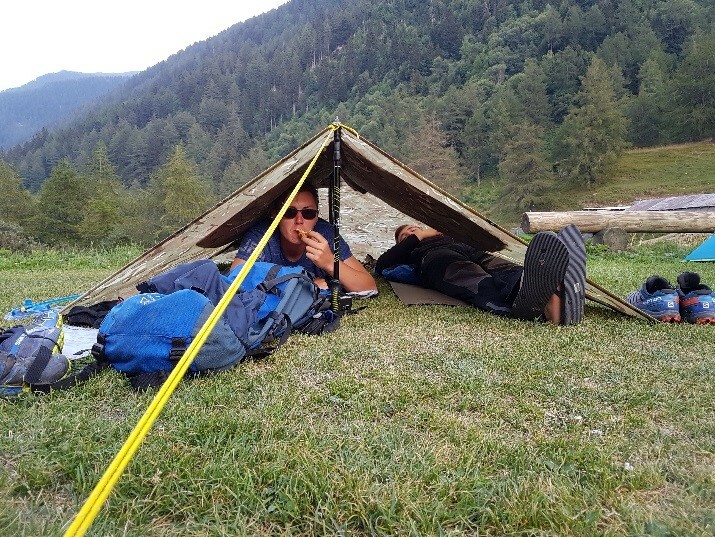 Exercise TIGER ALPINAE EXPERIENTIA 18 provided an event that met the aim and ethos. Team and individual skills were learnt and practised in arduous circumstances. Personnel were challenged both physically and mentally and taken out of their comfort zone on more than one occasion. The overall effect of the environment, training and execution of this exercise will have enhanced future operational effectiveness by developing individual and team skills in those who attended. Finally, thank you to the Ulysses Trust for supporting this extremely successful exercise. Dress is an important matter for a soldier and never more so than on operations. A soldier’s clothing not only provides him with protection against the elements and against enemy fire but also presents an important corporate image. The Services are judged on appearance not only by other British service personnel but by our Allies. Exercise personnel wore the appropriate clothing for the trekking and mountaineering phase. No military clothing was worn. A soldier’s effectiveness in combat can be hindered greatly by excessive weight being carried. The soldier needs to understand what options are available regarding load carrying equipment, how it should be assembled and what kit and equipment should be packed in it. Knowing this will enable the soldier to best select the method of packing equipment to suit the operation thereby making them more effective on the battlefield. The ‘Fight Light’ Mind-set. Personnel carried up to a max of 16 kg on the trekking phase and 18 kg on the mountaineering phase. There are those who view Battlefield Discipline as an unnecessary hindrance and at odds with the operational environment. They miss the point. It is about the application of standards that will maintain operational effectiveness and projecting a justified image of professionalism, rather than parade ground smartness. Inevitably, the enforcement of good Battlefield Discipline will be difficult at times: requiring leadership by example, diligence, energy and moral courage from the commander. 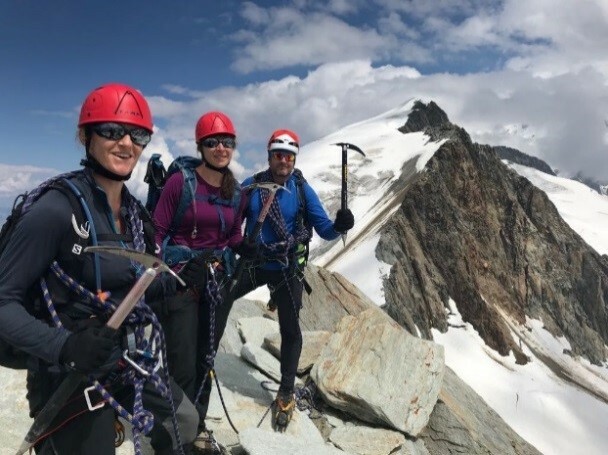 The exercise involved a daily Battle Rhythm of early starts, good hygiene, correct nutritional fuelling, hydration and learning and practising mountaineering skills underpinned by team work and the buddy buddy system. Soldiers, no matter how fit, require a nutritionally balanced diet to be effective in the field. Soldiers will more than often be required to cook for themselves using rations and cookers and therefore a good knowledge of cooking methods will allow the individual soldier to sustain him/herself correctly and therefore be effective in battle. Exercise personnel cooked for themselves and bought locally prepared and fresh food during the trekking phase, supplemented by freeze dried rations. Soldiers need to be rested to be effective. All climates require shelter for effective rest to be taken and soldiers should be able to erect their own temporary shelter using issued items. A good shelter will provide shelter from the elements and a base from which he/she can administer themselves. A knowledge of erecting shelters under all conditions will help the soldier to remain operationally effective. Exercise personnel used the two man basha shelter system during the trekking phase at official campsites. Lightweight sleeping bags and civilian bivi bags were demanded through the Loan Pool system. Every soldier should make up a survival tin and carry it in the field, depending on role and mission. There is a balance here with the ‘fight light mind-set’ for example, if you are operating as a recce patrol far from your operating base then carry one. if you are on a framework patrol close to your base then don’t. If you have still got your Fighting Order with you, you will have the essentials anyway. Exercise personnel carried a comprehensive personal First Aid and survival rations kit in addition to their normal equipment. Maintaining good hygiene in the field is essential if you are to remain operationally effective. During many of the conflicts the British Army has been involved in it is poor hygiene and disease that has caused the most casualties. To avoid becoming a casualty and to ensure you are able to remain fit to fight, a good knowledge of personal hygiene techniques is needed. Exercise personnel were limited with the clothing and equipment they carried in the trekking and mountaineering phases. Hygiene at campsites and in the Alpine huts was of a high standard and included personal and clothing/eqpt care. Care and maintenance of equipment. Being able to maintain the kit and equipment issued to you is a sign of a professional soldier. All kit should be ready for use at a moment’s notice and only correctly maintained kit will allow for this. Your commander needs to be able to rely on you to maintain your personal weapon and equipment without constantly checking on you. Failure to maintain your kit will be that it will invariably let you down when you need it most. Equipment Care was required daily for the trekking and mountaineering phase. Personnel learned how care for their own equipment and the technical mountaineering equipment.